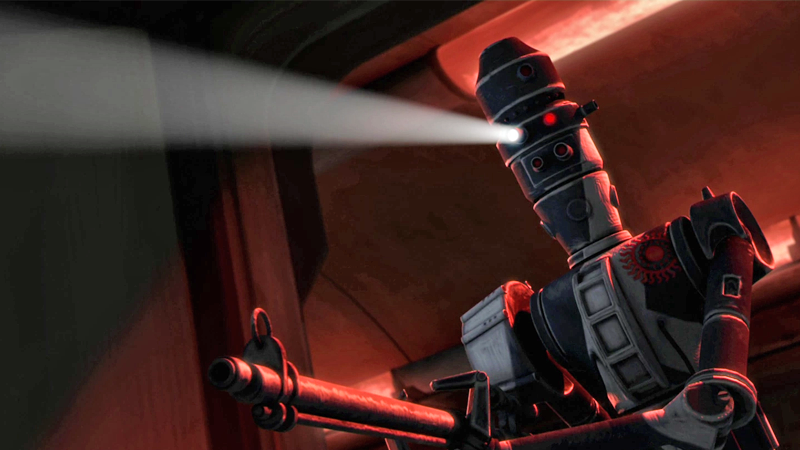 An IG-86 Sentinel Droid, as seen in Star Wars: The Clone Wars. Also not the droid you’re looking for! Many (including us!) had assumed that Favreau’s shot of a tall, lanky IG-Assassin Droid had meant that IG-88—one of the iconic bounty hunters seen aboard the Executor alongside Boba Fett in The Empire Strikes Back—would be returning for the Disney+ series. Fires were stoked even further when Favreau shared a more recent behind-the-scenes photo of director Taika Waititi (who will direct at the least one of the eight episodes in the show’s first season) recording voice-over dialogue for the the droid, thinking that IG-88 could be getting a pretty killer set of pipes for his appearance. But with The Mandalorian’s debut at Star Wars Celebration yesterday, we’ve got clarification that, well, this isn’t actually the droid we’re looking for. Speaking to Entertainment Weekly after yesterday’s panel, Jon Favreau confirmed that the droid he teased is an IG-Droid, but it’s not IG-88—it’s IG-11. In the fiction of the galaxy far, far away, the IGs are designed by Holowan Laboratories, a line of security, assassination, and enforcement droids that covered everything from the Magnaguards seen in Revenge of the Sith to the enforcement droids seen in Star Wars Rebels. IG-88 (specifically IG-88B), alongside four other identical assassin droids in his product line, gained sentience and went rogue, killing his creators and deciding to roam the galaxy as a terrifying mercenary. Pleasant chap!